Can you smell what 4Culture's cookin'? Now that we have your attention, it’s time to use your senses out on the Burke-Gilman. Let’s put aside our differences about that rage magnet of a trail and enjoy some art for art’s sake. 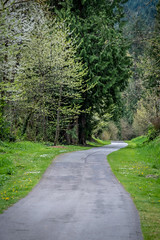 4Culture’s Trails Project will have their trail fragrances on display for all on King County’s portion of the trail. “Trail fragrance…bwuuuh?? ?” You’ll have to experience it first hand, so get out there and inhale some art. You can get the deets over at the Trails Project blog. Previous Post Who cares? YOU do!